RUSH: If you are a person who describes yourself as pro-life, and if you’re alarmed over the direction abortion is taking in this country, there’s a movie opening today in a thousand theaters around the country. 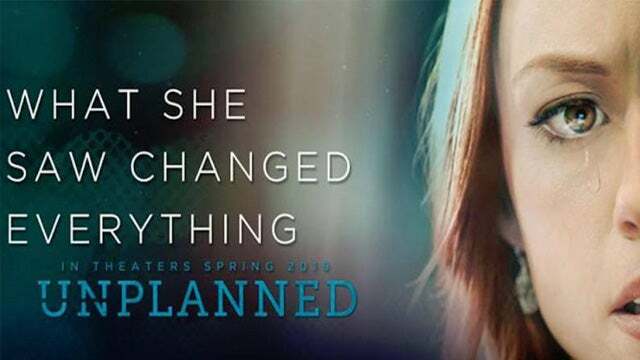 It’s called Unplanned, and it really is a takedown of Planned Parenthood. This movie is apparently so effective that nobody will accept any advertising for it, not even Lifetime, the Hallmark Channel, HDTV. The movie has been given an R rating because of the “sensitive nature” here. It really is a takedown of Planned Parenthood, and it attempts to — in movie form — awaken and inform as many people as possible about what really happens in these places. But when you slap an R rating on it, guess who you’re basically telling they shouldn’t see the movie? Christians, which is the primary audience. So the MPAA slaps an R rating on this thing simply to further diminish its efforts to be marketed and thus to be seen. Since there isn’t any advertising for this and except on Fox News, it may be a movie that you would be greatly interested in seeing, and it may be something you would like to be tell other people about, but you don’t know it’s opening today because they can’t get any advertising bought. Pure Flix is the producer here and the distributor, and the name of the movie is Unplanned, and they’re opening in a thousand theaters today. So it’s not insignificant. It’s not like 3,500 or 4,000 that you would get for a pro-abortion movie or a Tom Cruise movie or something. But it’s a decent number of screens. So I just wanted to mention this because it’s another — I don’t know — free market, censorship. Whether it is or isn’t, they just won’t sell advertising. They don’t want people to know about this movie. And it’s not because of the “sensitive nature.” It’s because of the content. They just don’t want to see Planned Parenthood portrayed this way. Planned Parenthood has protected status. It gets federal money. It’s a member in good standing of the Democrat National Committee and the Democrat Party. So I just wanted let you know that it’s opening today — Unplanned — if the subject matter is of interest to you.